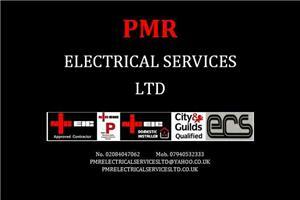 PMR Electrical Services Ltd - Electrician based in Sutton, Greater London. We have over 25 years experience in the trade and are approved contractors and domestic installers with the NICEIC. We cover all aspects of electrical works, but our expertise is in fault finding and bringing your installations up to date and in compliance with current regulations. You don`t necessarily have to rewire your property to ensure that it is brought up to date, 99% of the wiring in the properties we test all comply with current regulations, the fuseboard in the installations just needs to be brought up to date with rcd protection installed. All our works are guaranteed and have an NICEIC backed warranty. We are based in Sutton but cover most areas. The electrical supply in a standard 3 bed home can be brought up to date from as little as £1080 and come with an installation certificate and a 6 year NICEIC backed warranty. Sutton, Epsom, London, Banstead, Purley, Wimbledon.